Bait Divers, Bait Divers, Bait Divers!!! One of the best bets for springers!!! Start with Hot 'n Tot diving plugs, remove all hooks and split rings (leader can catch and break in split ring so be sure to remove!!) Paint entire plug flat black to help discourage aggressive fish from striking it. 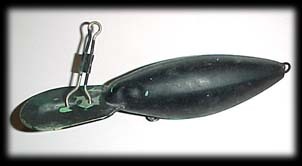 A Hot 'n Tot, a great plug to modify for bait diver use! From the belly eye of the plug, I like to attach a five foot leader (via a good quality snap swivel) to a dual 2/0 hook setup ... 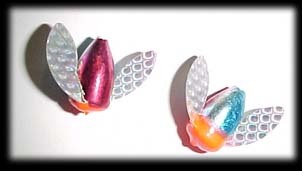 I like to use a size 8 or 10 spin n' glo or winged cheater above the hooks with a 5mil green bead between the hooks and bobber. Color choices for the bobber are the 'sundae' and 'patriot' colors. My personal top choice is to rig a shrimp cocktail bait on the hooks. Use a full sandshrimp with a small egg cluster held under the tail section via your bait loop. If you are fishing the 'Duc under low and clear conditions, you might try using a plain shrimp tail or glob of eggs behind the diver... these are particularly effective when the fish are not biting well ... which, unfortunately, can be a lot of the time!! The best way to fish this rig is to anchor your boat above a hole and slowly drop the baits down into the top end of a hole...be patient, especially if you see springers rolling in a hole. Pay particular attention to the edges of fast current seams meeting slow water... these areas are springer heaven!!! Bank anglers will usually have the best success drifting straight eggs with minimal weight, again, pay close attention to current seams.